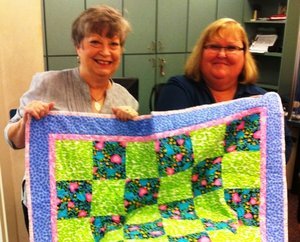 Betty Wright's North Georgia chapter has donated over 4,000 quilts in the 6-1/2 years they have been in existence. If you don't believe it, check out the delicious looking cake decorated accordingly, proudly displayed by Pat, Jane, Marilyn, Chris, Betty and Diana. 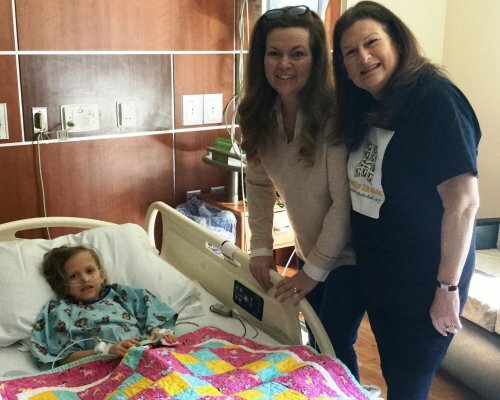 As the chapter grows, North Georgia has added another children's hospital to their list: Hughes Spaulding, joining Egleston and Scottish Rite, which are all Children's Healthcare of Atlanta (CHOA) in different sections of the city. Kudos to all those fine Georgia quilters! 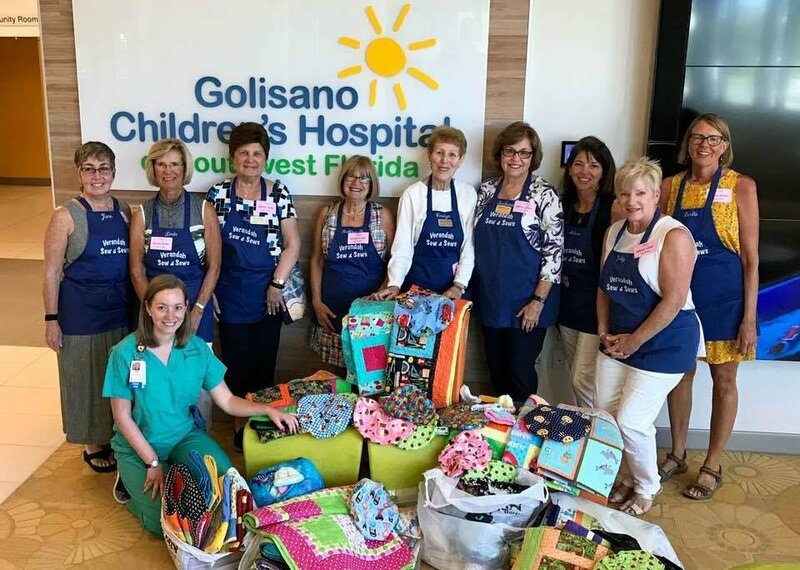 Recently, the Verandah Sew & Sews branch of the SouthWest Florida Chapter of QFK delivered over 60 quilts, plus many surgery hats, knit hats, preemie blankets and cough pillows to Golisano Children's Hospital in Ft Myers, Fl. They were taken on a wonderful tour of the hospital. Stephanie Levin, the founder of the group said, "It made our work feel so worthwhile." On their way out, they met up with Gayle Edwards, who was delivering another 69 quilts from the rest of the SW FL chapter. 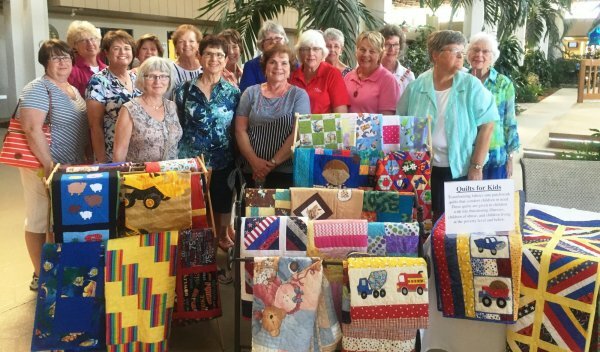 Since retired school teacher, Rosemary Campbell, started the Bluegrass Chapter in 2010, they have donated more than 2,400 quilts to Kentucky Children's Hospital in Lexington, among other locations, and have added knitted and crocheted caps and hand-made bears. 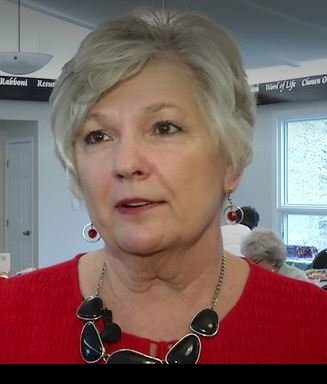 One of the members, Deb Evans, is gratified to be on the giving end of the process. "I had a son who was born with problems, so we were those parents in the NICU. When people brought things in, it really meant a lot." Many thanks to Fred Petke whose article in the Winchester Sun highlighted the Bluegrass Chapter's achievements. 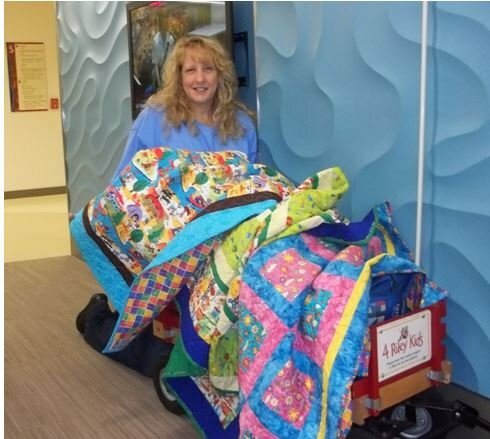 From 11 quilts in 2011 to over 2000 quilts in 2017, QFK Bluegrass chapter has comforted thousands of patients at Kentucky Children's Hospital in Lexington. 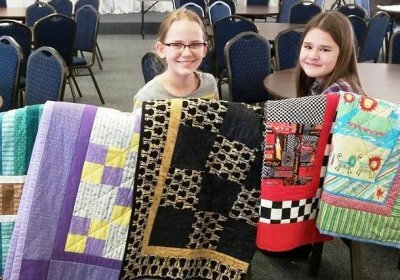 In December 2017, the chapter celebrated their 2,000th quilt. They have also delivered 523 pillowcases, 451 NICU sheets, 126 flannel receiving blankets, 109 fleece throws, 460 hospital gowns for dolls, 257 superhero capes, 153 knitted hats, 77 mermaid and shark tail blankets and 76 sets of loveys for pediatric oncology. The group also sends quilts to Green House 17, a domestic violence shelter that serves 17 Kentucky counties. Chapter leader, Rosemary Campbell says, "It's a wonderful feeling. I don't know any quilters who don't have a generous heart, who love to use their skills to make people smile." Dominion Dave and Staffer Pam loads quilts for Norfolk. We Couldn't do it Without Dominion Energy! We are sending out a huge thank you to Dominion Energy Dave today. 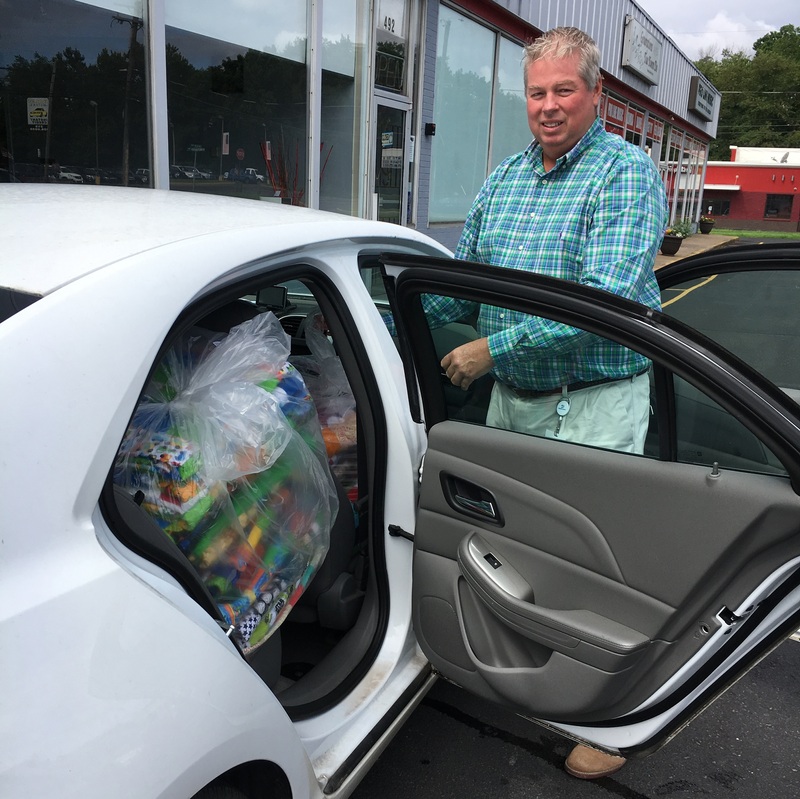 On his trip to the local Dominion office in Fairless Hills, he dropped by QFK headquarters and filled his car to the roof with hundreds of quilts destined for the children at the Children's Hospital of the King's Daughters in Norfolk, VA.
Joy Parker promptly sent us a heart-felt note from the hospital assuring us that "every quilt found a home." 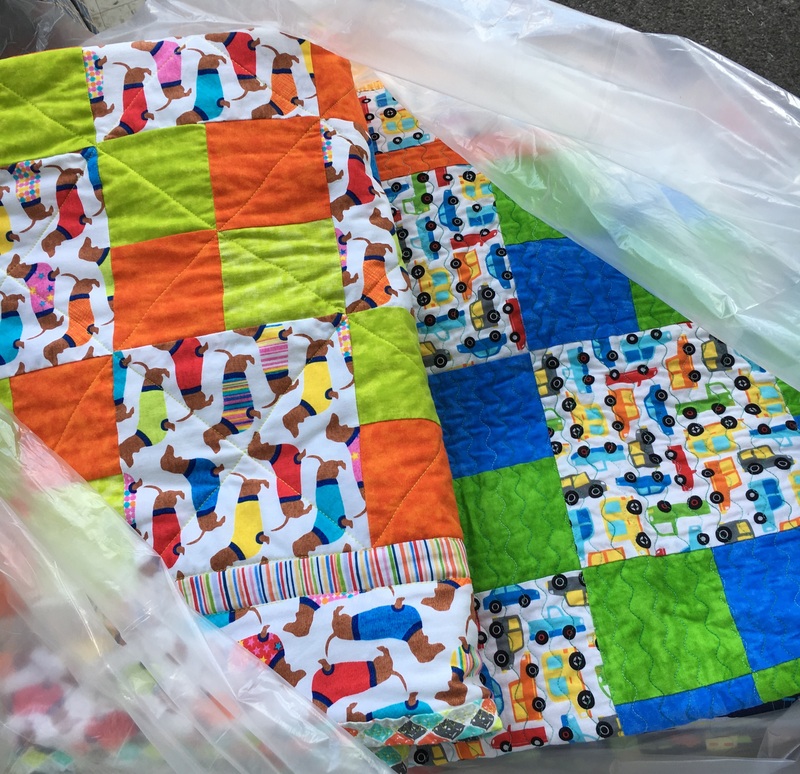 She writes, "I loved listening to (the staff) match the quilt themes to their patients...they were especially pleased to have designs for boys and girls...just wanted to share the appreciation with your group." Thank you, Dominion for being there from the very earliest days of Quilts for Kids with grants enabling us to fund numerous workshops over the years so that we can put quilts into the hands of the children who need them! 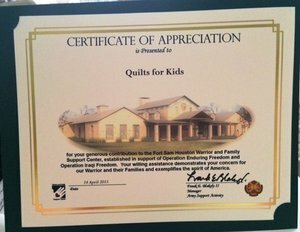 Falls Township of Bucks County, PA Appreciates Quilts for Kids! By including us on their website, they are helping us reach more quilters, volunteers and donors. Hoosier Hills QFK starts off 2017 right! 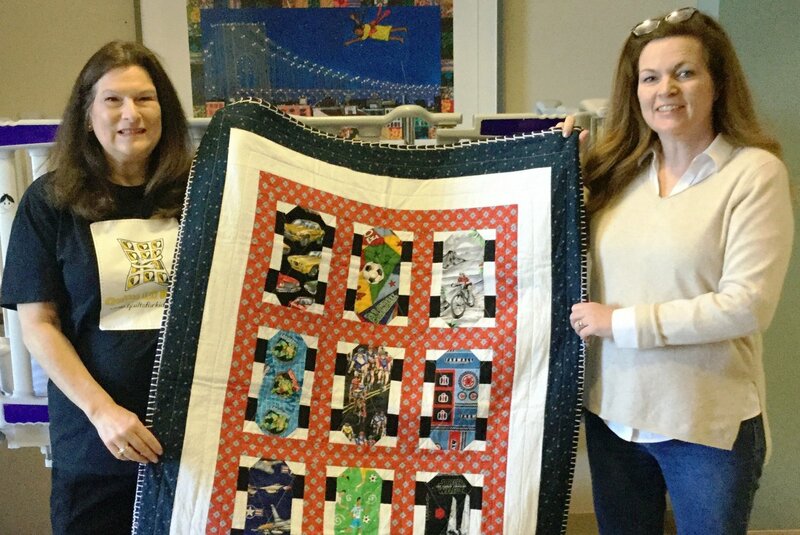 Karen Casey, Chapter Leader of QFK's Albany, NY, Chapter recently shared a wonderful day with the local news team at WNYT, explaining how the quilts are lovingly put together and delivered to seriously ill children in the hospital. Normally, the quilters are not able to go in and visit with the children, but a special exception was made that day. See the heart-warming video here. 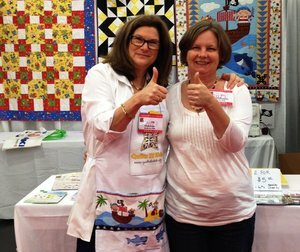 One of the best parts of being at the Mancuso Quilt Fest in New Jersey is meeting some of our amazing volunteer quilters. Some are younger than others. It's Always a pleasure to meet all of you. Thank you all for the incredible work you do. It matters. 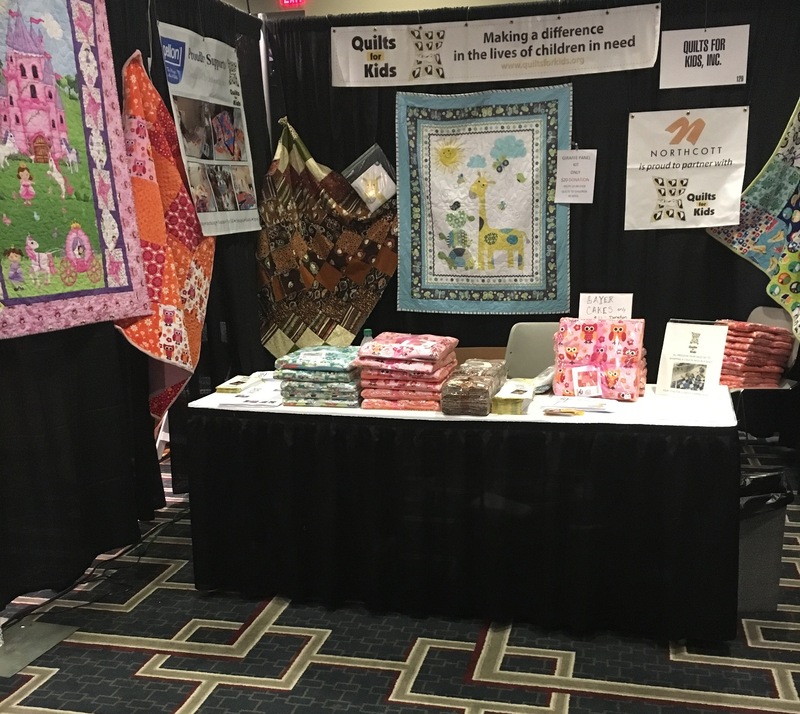 Come visit us again at The Oaks show September 14-17, 2017, Oaks, PA. Feel free to drop off any quilts you'd like to donate. We will make sure they get into the hands of the children needing them. On the left: Linda greets two of our most faithful volunteers...On the right, Linda meets one of our newest quilters! 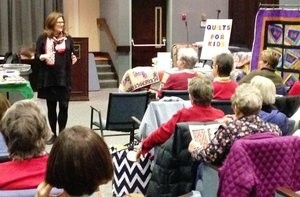 Marie Bostwick launches her new book, The Promise Girls, at Quilts for Kids headquarters! 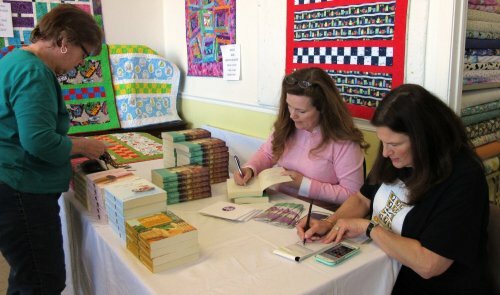 Marie Bostwick visited a Quilts for Kids Workshop and signed her new book, The Promise Girls, plus several past favorites for avid fans. 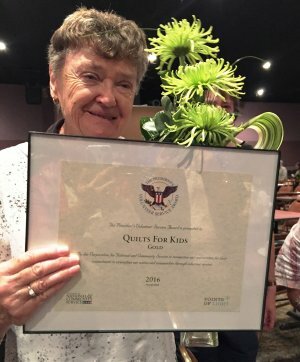 Quilts for Kids founding president, Linda Arye helped keep up with the financial aspect of things. Thanks to Barnes and Noble, signed books are still available at their Oxford Valley location! This "skateboard quilt" is the product of a recent QFK workshop. 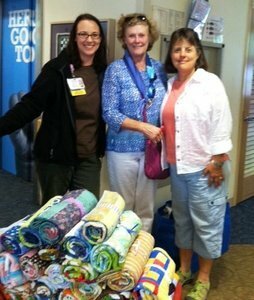 The next day, Marie accompanied Linda on a mission of mercy to Capital Health System to hand out quilts to children. This trunk-load of 22 bolts of vibrant batiks was graciously donated to QFK Silicon Valley Chapter when a custom beachwear designer sadly had to go out of business. However, her loss is a wonderful gain to all the volunteers who will turn them into comfort quilts to brighten the days of seriously ill children when they need it the most. of Quilts for Kids was recognized at the Lee Health Volunteer Appreciation Luncheon with The Presidential Award for over 10,000 hours of service. Chapter Leader Shirley Condon was presented with flowers, a pin, and several citations honoring our chapter for our contribution for 2016. Six chapter members accompanied Shirley to the luncheon. 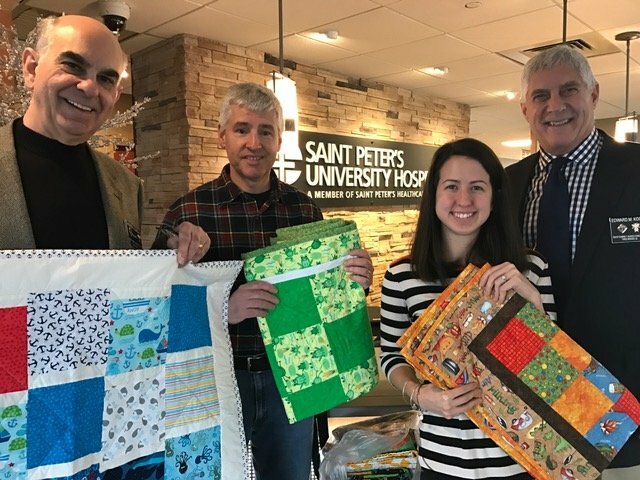 The Knights of Columbus Bishop Edward T. Hughes Council #15540 presented quilts handmade by Quilts For Kids, Fairless Hills, PA. to the hospitalized children at St. Peter’s University Hospital, New Brunswick on Saturday, January 28, 2017. Representing the council (left to right) are: Knight Andrew S. Casella, Grand Knight Joseph Lang and Knight Edward Koch. 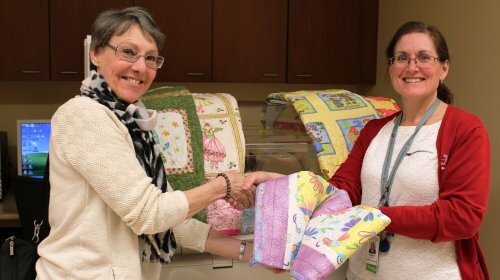 Receiving the quilts on behalf of St. Peter’s University Hospital is Child Life Specialist Kristyn Santee . 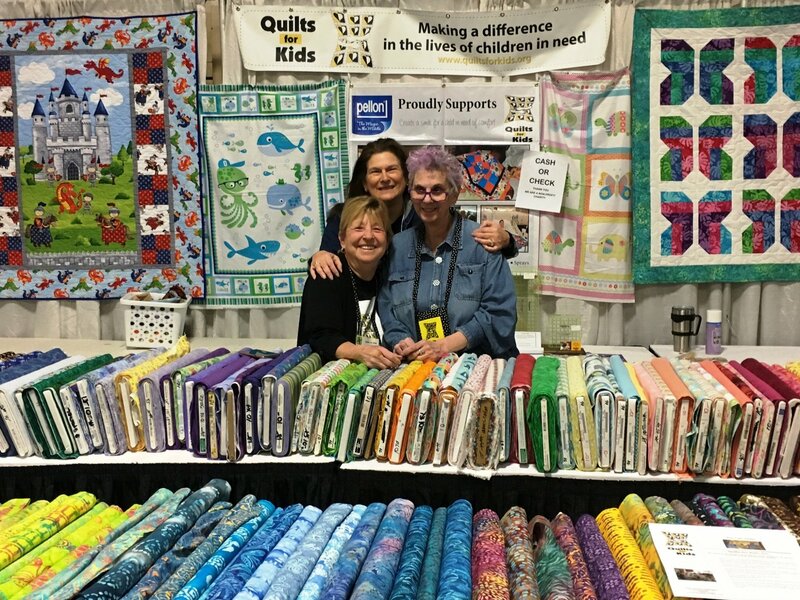 Pictured: Linda (center) and volunteers Marilyn and Judith Had way to much fun at the Mancuso Quilt Fest of New Jersey in Somerset March 2-5. A huge THANK YOU to David Mancuso and the team whoeachyearenable us to bring comfort to many more children in need because of the volunteer quilters we meet. 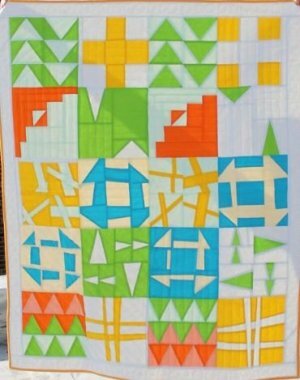 One of our wonderful partners, Timeless Treasures, teamed up with the NYC Metro Modern Quilt Guild to come up with these striking designs using the Dash Basics Quilts for Kids fabrics. You will love quilting with these eye-catching colors, and the best part is that you will be helping turn tears into smiles as Timeless Treasures donates a percentage to us! 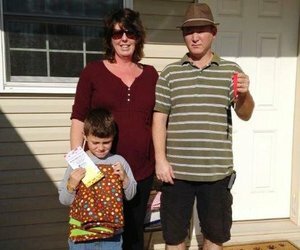 This afternoon, we dedicated our 103rd Habitat Bucks home for Victoria and her children, Joyce and Darius. 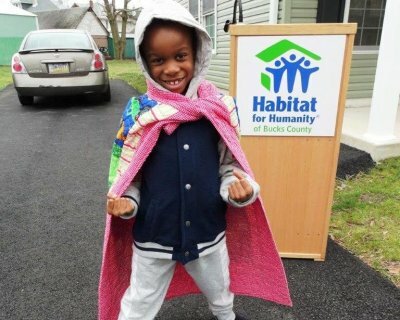 Victoria worked so diligently for her home--and we're glad that your quilt will always be as special part of it! Darius was SO excited to get his quilt! It didn't take long for him to ask to have it wrapped around him, superhero-style! ...and our first delivery of quilts of the new year to Golisano Childrens' Hospital in Ft Myers, Florida. After a record year of over 1300 quilts, we're off to a great start with several new members sewing at our meetings and at their communities located in the area. We're excited to be part of such a wonderful organization that strives to bring comfort to children in need. ... had the opportunity recently to share 30 of their precious little quilts with Buckner Orphanage in Conroe, TX. The Dalls-based organization has been in existence for many years, but just recently opened a branch in Conroe. 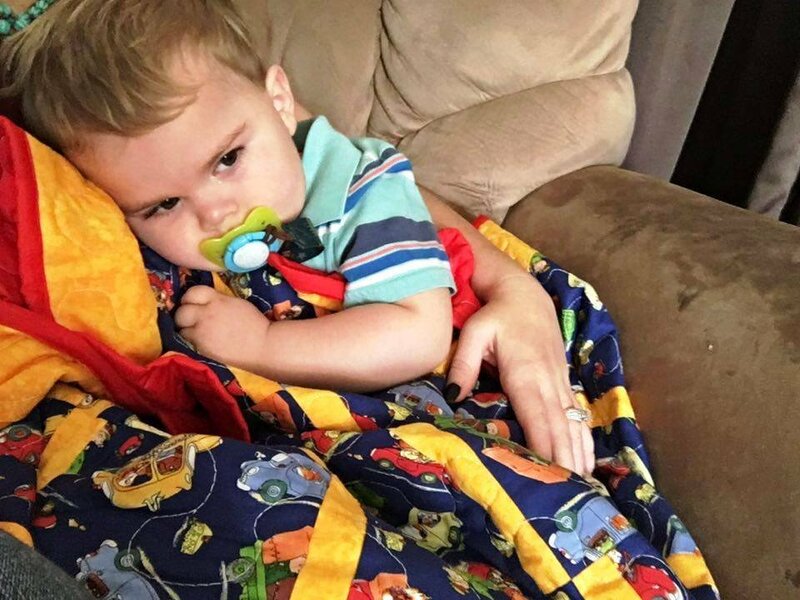 Linda Deeter, Chapter Leader, writes, "It is such an incredible feeling to know our quilts will be wrapping some little ones in love who are in major crisis in their lives and need comfort & security. What an honor and privilege to share our love with them"! From Left: QFK's LaDonyce Hamilton, Linda Deeter, Amanda Runnels, Carrie Johnson, Tiffany Dixon and Anna Rodriquez, Buckner Children & Family Services. to our friends at Raymour and Flanigan for helping us fund-raise at their Langhorne, PA, location! 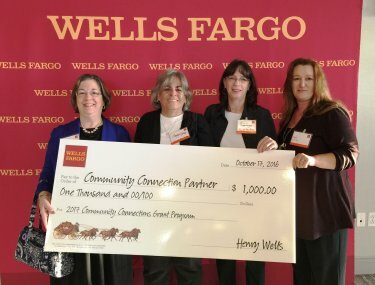 Founding president, Linda Arye (center) accepts a generous check. 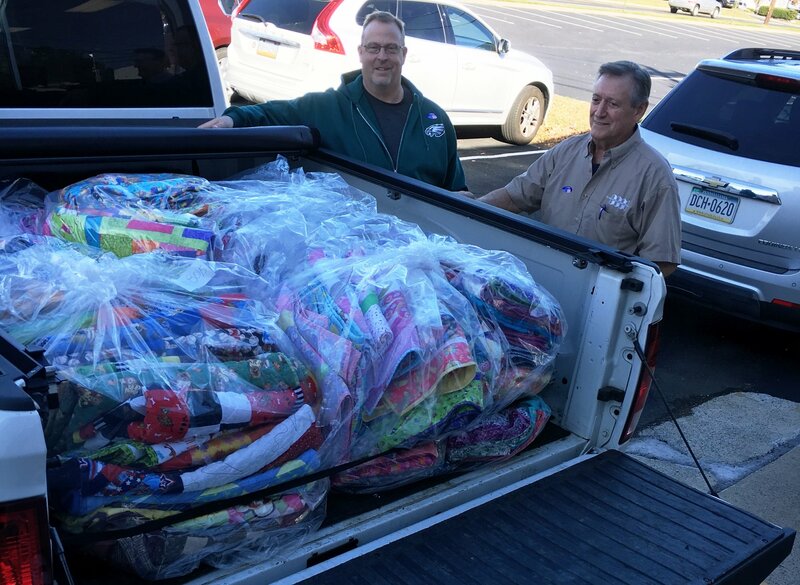 150 quilts were loaded up and taken to the Third Annual Turkey Bowl by Raymour and Flanigan staff member David, and a friend with a truck, Mr. Jacobe. This year's Turkey Bowl was a great success, providing Thanksgiving dinner to over 500 guests who celebrated with free bowling, games and a photo booth. 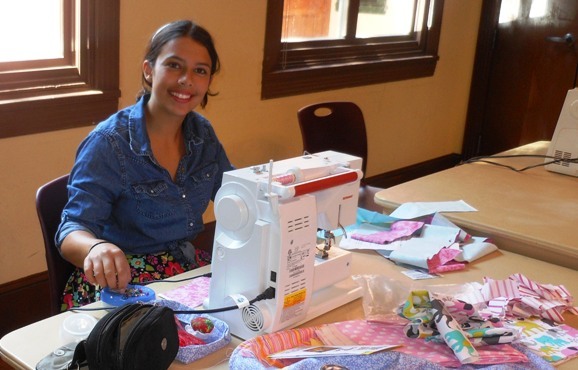 All 150 young recipients of the quilts were delighted with their hand-made gifts, stitched with love by QFK volunteers. Quilts are always made from new, 100% cotton fabric. What fun our York, PA, chapter had at their KOHL'S volunteer day. Volunteer quilters and Kohl's staff worked hard to create fun, beautiful quilts that will help children in their community. Thanks, Kohl's, for pitching in to make our communities better places to live by helping children in need. 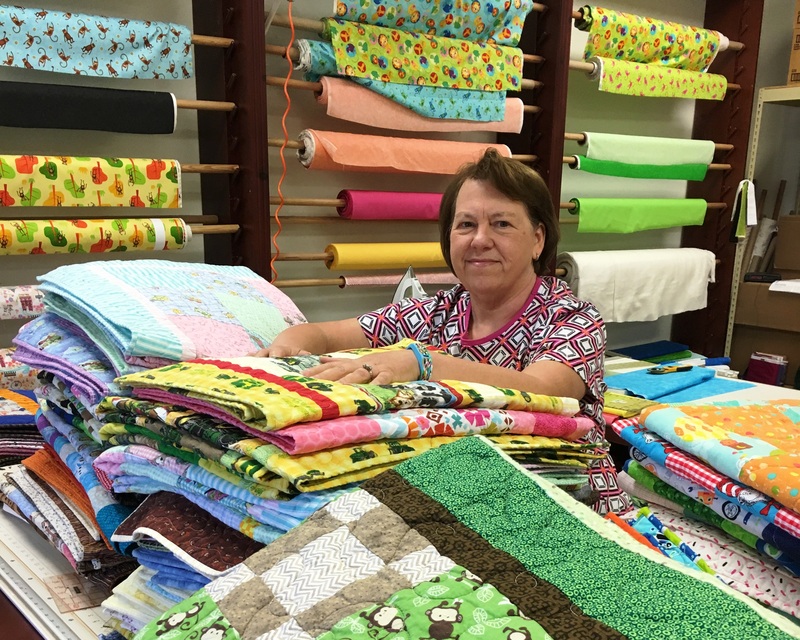 Laurie drove to headquarters in Pennsylvania all the way from Summerville, SC, with a load of 100 beautiful quilts...and took fabric back with her to start on another batch! 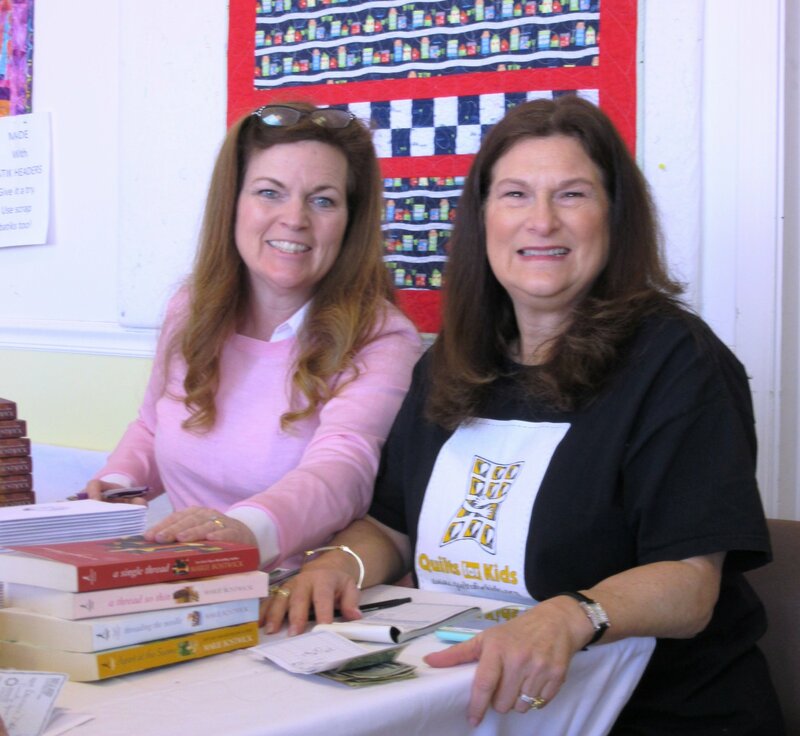 We love our dedicated volunteers. 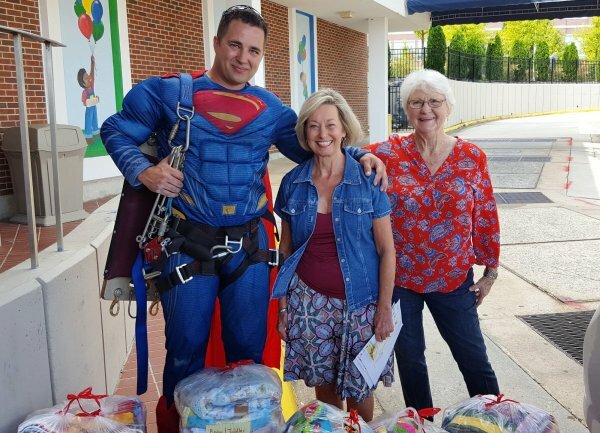 When Waycross, GA, chapter leader, Cheryl Sloan (center) and volunteer Audrey Mock (right) recently delivered 70 quilts to The Children's Hospital Navicent Healthcare in Macon, they ran into a familiar hero and discovered someone else who brings smiles to the faces of hospitalized children, just by washing windows! 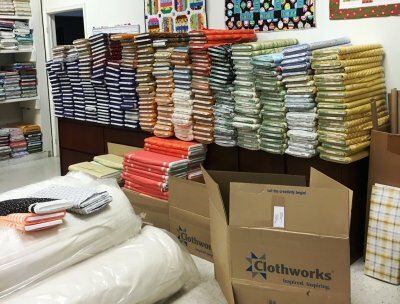 Just when we were running low on donated fabric, Clothworks came through with a truckload! We never tire of thanking this wonderful company and their awesome staff for being dedicated to helping us make a difference in the lives of children in need. Cindi has already worked her magic on getting kits made and shipped. Remember to order your free kit soon to see this beautiful fabric up close, and please look for Clothworks Fabric in your local quilt shop. We are proud to support the companies that support us and the children we seek to comfort with your quilts. Thank you, Local Linked Ladies! 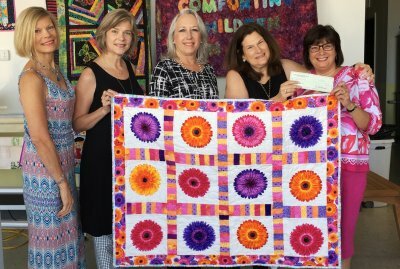 When the Linked Ladies of Langhorne met founder, Linda Arye, and heard about Quilts For Kids, they immediately wanted to help by doing an event to raise funds for us, including raffling a quilt made by Linda for the express purpose of fund-raising. These ladies are dedicated to making a difference in their community, and we are grateful to them for including us in their causes. We are honored and humbled by their generosity. Thank you, Linked Ladies of Langhorne! When devastating flooding hit Baton Rouge recently, Doane Academy teacher, Ginny Miller, got to work mobilizing the staff and parents of the venerable Burlington, NJ, school to adopt a family from her daughter's workplace, Louisiana Key Academy, so that the 105 students out of 300 who had lost everything could be helped. 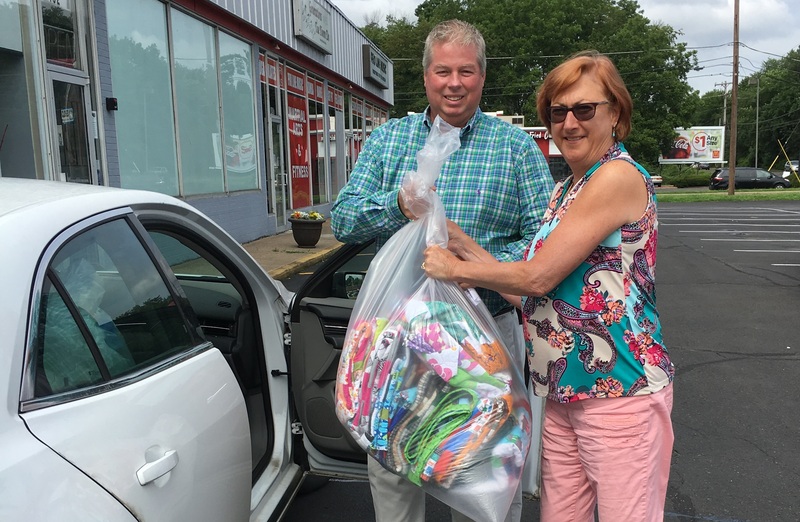 In addition to clothing, toiletries, towels and other essentials, 105 quilts were loaded into the van headed for Baton Rouge, thanks to Doane parent, Lisa Esposito. Quilts for Kids is once again so grateful to be able to comfort these children when they need it most. 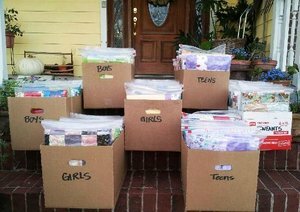 Bakersfield, CA, Chapter just packed its 500th kit! That's a lot of work in just 4 years! 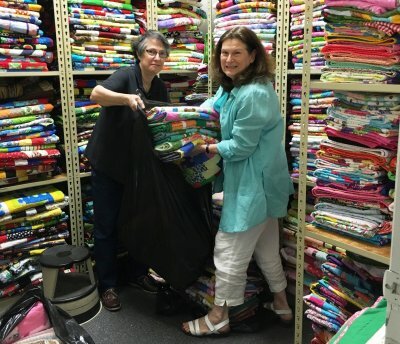 Hard-working volunteer, Lois, and Founding President, Linda, pack quilts to send to the flood ravaged area around Baton Rouge. Just as they get those huge bags filled, more calls for help come in. Keep on quilting! The need is always there. Big shout out to 'Beyond the Reef' pattern company for sending me a 45 lb box of gorgeous batiks and fabrics, mostly all large pieces. Also, we received a call from a fabricaholic who was liquidating her 10x20 storage unit...our chapter and satellite chapters are filled to the brim with gorgeous fabrics. A local non-profit dance troupe took the fabrics we couldn't use. Such a blessing to so many people. We try to use a lot of fabric that isn't hospital appropriate for the homeless kids and Foster kids. We will be using the scraps of the scraps to make dog beds for the local SPCA, so nothing goes to waste here in our chapter. Pillows for Pets and Quits for Kids. :-) I keep a trash can lined with a pillowcase next to the machine or when I'm cutting kits and the beds practically make themselves. Since I work full time, I have another volunteer finish them up. I hope everyone is well at Headquarters. We are enduring another bad fire season and just barely over drought conditions here in the state of California. Carole Koroluck, founder of the West Chester fourth Wednesday group, was recently interviewed by the WC Press, in West Chester, PA. 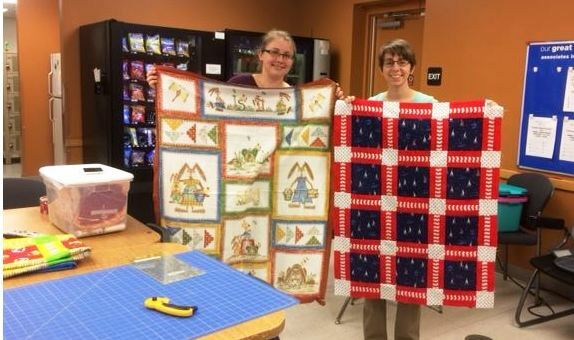 Founded just a short time ago, the group now boasts over 40 volunteers who come together for four hours once a month at the West Chester Public Library to make quilts for Quilts for Kids. See page 49 of the WC Press for full article. York, Pennsylvania, Chapter of Quilts For Kids held a workshop at the end of July at Kohl's East York Store in York. 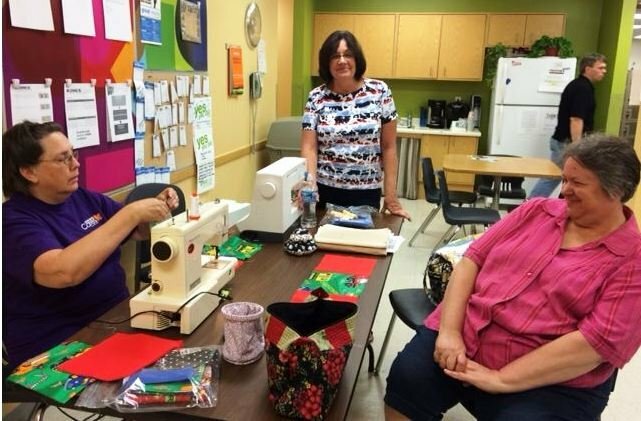 Sue, Donna, Susan, Doris, Jackie, Marilyn and Mary Anne worked on quilts with store manager Ciere, and four employees. Thanks to Kohl's Associates In Action Program, the York Chapter will receive a $500.00 donation! Thank you, Kohl's, for your generosity to non-profits! A HUGE thank you to Bernina for sponsoring our booth at Bernina University in New Orleans! What a wonderful group of dealers from so many states and countries. It's been fun meeting them and starting chapters of QFK in many new shops. Here's to all the children in need we will be able to comfort because of your generosity. 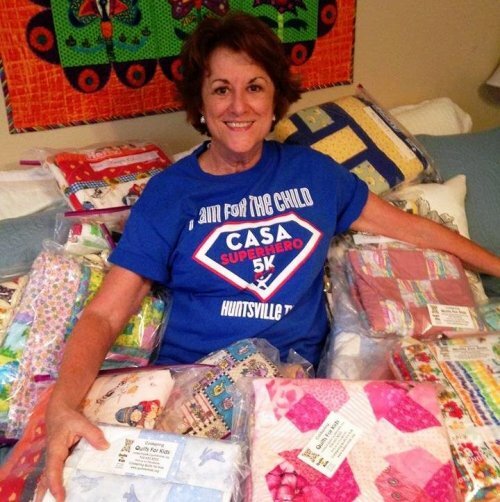 Coldspring Quilts For Kids started off the month of May by donating 25 adorable quilts to CASA in San Jacinto County. CASA is Court Appointed Special Advocates for children. The quilts will be given, as needed, to little ones who are in the court system and experiencing an unsettled time or trauma in their lives. 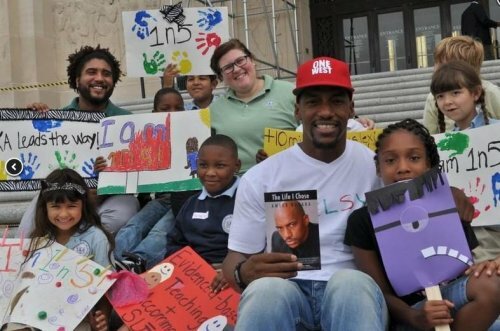 We know they will comfort and let these little ones know, they are loved! Shown here, accepting our gifts to CASA, is Terri Cook, Vice President of the Board, CASA of Walker, San Jacinto & Trinity Counties. When a mammoth wildfire consumed over 1.4 million acres in Alberta, Canada, forcing thousands to flee their homes, our Sault Ste. 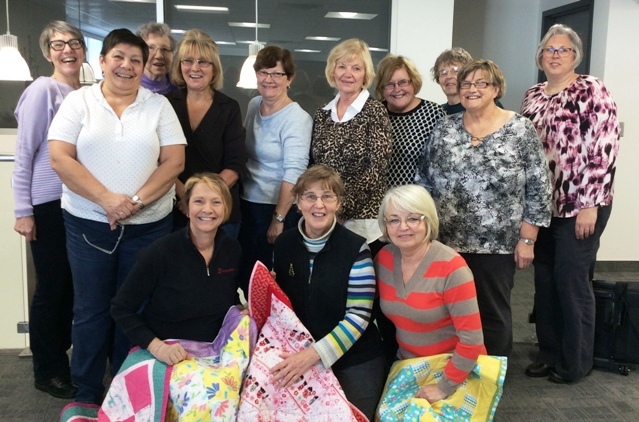 Marie Chapter in Ontario sprang into action, delivering quilts to as many of the hardest hit families as they could. 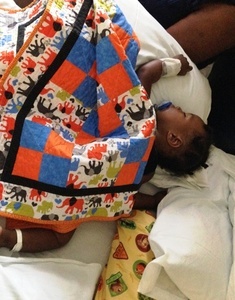 Amid the devastation, each child was able to hold on to at least one thing that was his or her very own, a handmade patchwork quilt, made with love. 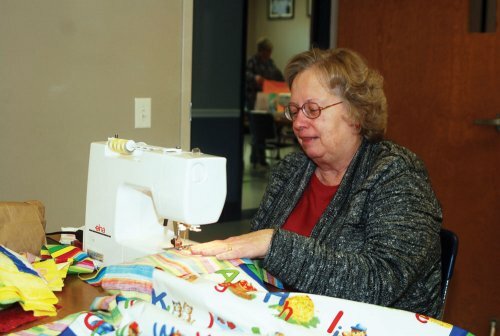 PENNINGTON VOLUNTEERS SEW 1,000TH QUILT! 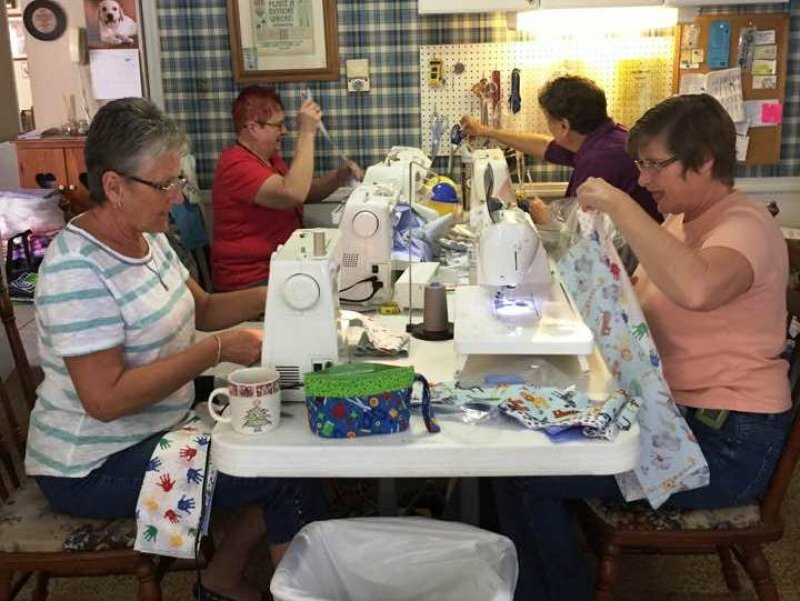 (Pennington, NJ - June, 2016) For the past four and a half years, a dedicated team of volunteers has been meeting monthly at Pennington Quilt Works to design and sew quilts to give to children in need across the country. 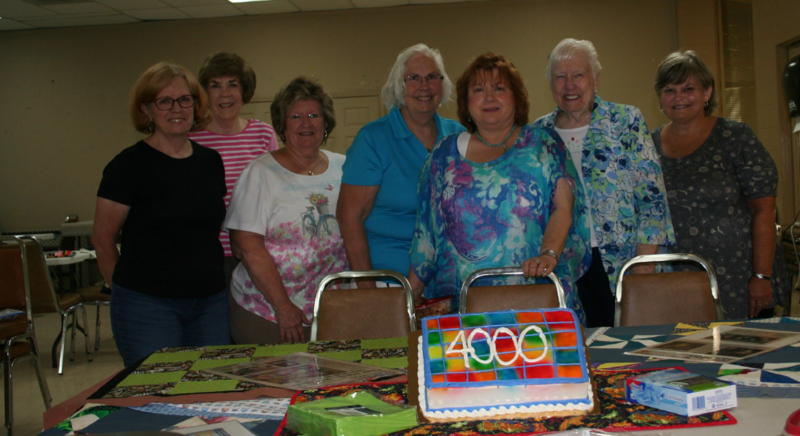 In April they celebrated the production of their 1,000th quilt, which they donated in May. 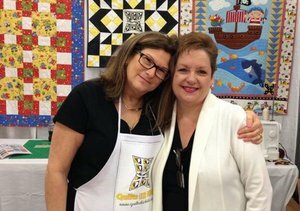 The quilters come from a cross section of central New Jersey communities with a desire to use their quilting skills to assist children. 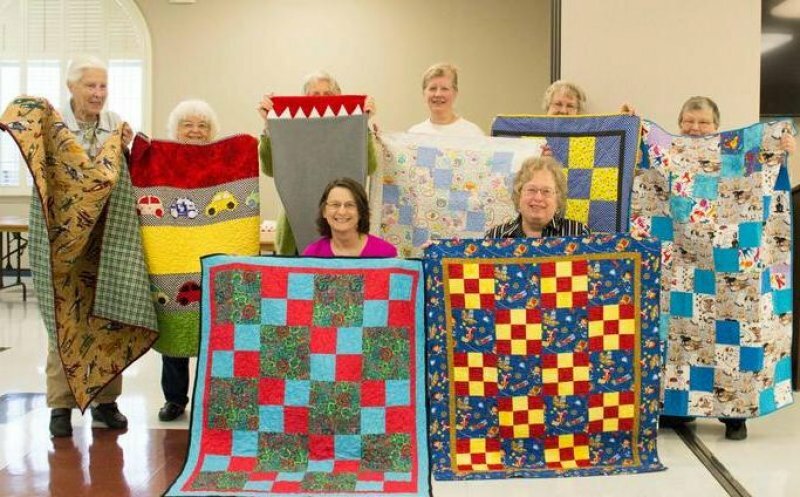 The group produces approximately 30 quilts per month. 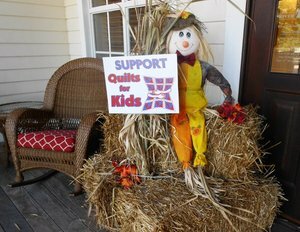 Since the group's inception, Pennington Quilt Works has donated their facility as the meeting place for the local workshop of Quilts for Kids. They have also been very generous in donating supplies. This group began as a workshop in October, 2011 with the help and support of the shop owner, Jan Crane, and the shop manager, Arlene Stilson. That first month, the local Quilts for Kids coordinator, Debbie Greaney, was the only one in attendance! Slowly but surely with the help of the shop in finding volunteers, the group grew to over 50 interested volunteers of which 20 attend the full monthly workshops regularly. 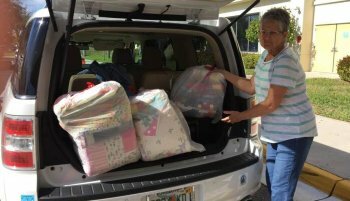 To more accurately reflect their delivery area, Lehigh Acres is now Southwest Florida, shown here delivering 150 quilts to an area hospital. Shelly Albert writes, "The 7-Lakes Piecemakers of Ft Myers teamed up with our chapter this season as their community service project. 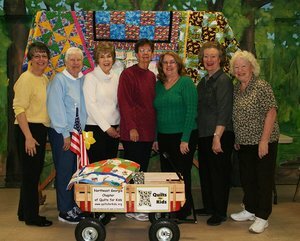 After displaying the quilts at their recent Crafts Show, they donated the quilts to us for distribution. What we thought was going to be 50 or 60 quilts turned out to be about 150 quilts, each one different and lovingly made." Vicki Young of our Canadian Chapter hands over quilts to nurse manager, Kirsten, at Sault Area Hospital. 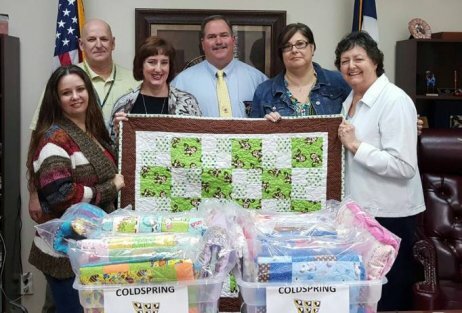 QFK Coldspring, TX, Chapter recently donated 26 quilts to San Jacinto County Sheriff's Office. 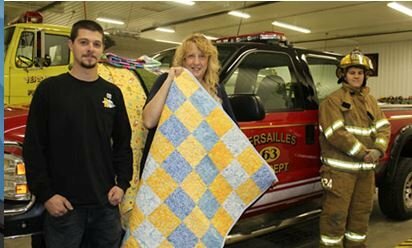 These quilts will be placed in emergency vehicles and used to comfort children who are injured, ill or in crisis. They will make another delivery soon to the Sheriff's office so they will have enough quilts to place 2 in each vehicle. 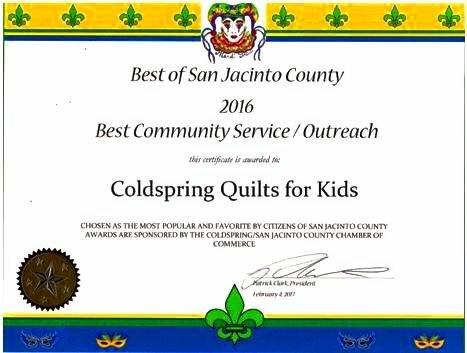 All San Jacinto County Fire Department Vehicles and First Responders now are supplied with quilts, and Coldspring volunteers will maintain their supplies as needed. Ms. Cheryl Sloan and Ms. Marie Williamson with the Georgia Chapter Quilts for Kids recently donated beautifully handmade patchwork quilts for Unison Behavioral Health children in need. The handmade quilts were given to Unison Behavioral Health’s Garden Gate Residential Program, which is a long-term Women’s Substance Abuse Program where moms can bring their children into care with them. Pregnant moms can use these handmade quilts for their little ones once they arrive as well as moms with smaller children who can benefit from a quilt to sleep with or take a nap on. THANK YOU, THANK YOU, THANK YOU so very much from the bottom of our Special Immunology hearts! Our kids and families LOVE, LOVE,LOVE the quilts I picked up yesterday from Quilts for Kids. Receiving a quilt makes them feel so good that someone took the time to make them a quilt and spread the love, and most importantly that someone cares. Often they cannot even share their diagnosis with their family members for fear of being shut out and disowned. They have experienced so much trauma in their lives, so the quilts are something very special to them. Our staff was so super excited to see all of the quilts when I placed them on our conference table this morning and were claiming certain quilts for certain patients. The patients who received them so far today were absolutely thrilled! I even gave one to my 17 year old who arrived from Africa in the past few months and has had lots of issues missing her orphanage and adjusting to life in the US. She just needs some extra TLC and was delighted with the quilt. I offered it to her saying that it was not very big and it was okay if she didn’t want it, but she wanted it so much! Thank you all and also all of the quilters out there who have helped to make these stigmatized people feel so loved! 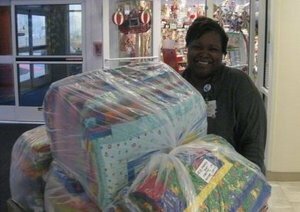 Terry Warden, QFK Winnfield, LA chapter leader made a Christmas delivery of 23 quilts to the Children's Miracle Network Hospital in Alexandria, LA. 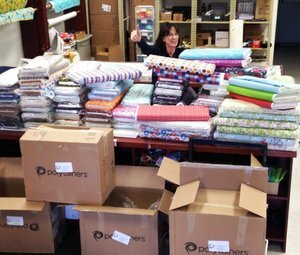 One of our wonderful volunteers, Barbara Lawless recently stopped by to pick up quilts for destitute children living on reservations. 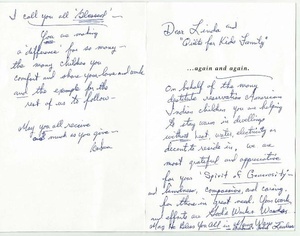 She shipped them at her own expense, and wanted to let us know that we are helping children "stay warm in dwellings without heat, water, electricity..."
She goes on to write, "We are most grateful and appreciative of your 'spirit of generosity' and kindness, compassion and caring." 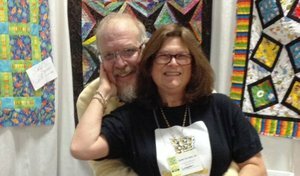 "For your generous contribution to the Fort Sam Houston Warrior and Family Support Center..."
stopped by the Mancusco Quilt show in New Jersey to say "hi" to Linda. An ardent supporter of Quilts for Kids, he always makes us feel special. 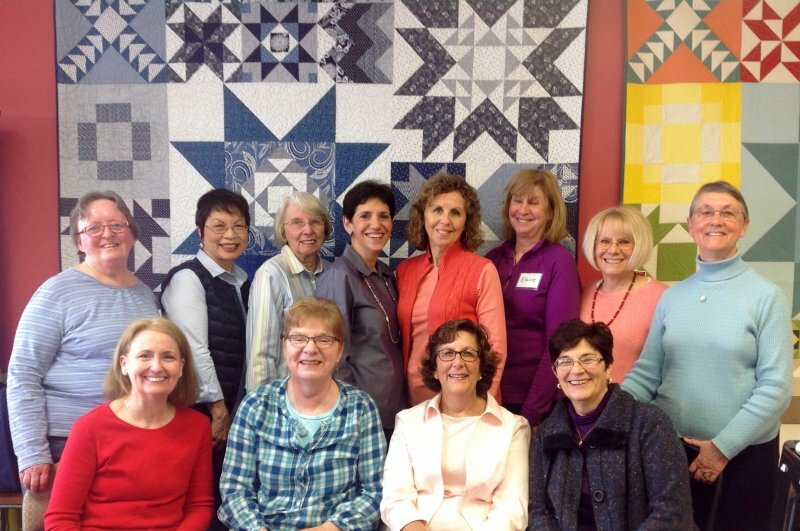 Jane Darling's dedicated group of volunteers has completed 1,000 quilts for serious ill children since December, 2009! 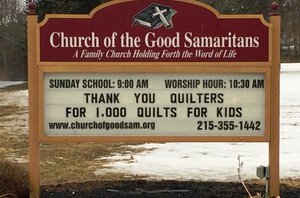 Kudos to them, and thanks to Church of the Good Samaritans in Holland, PA, for generously giving the quilters space to work. 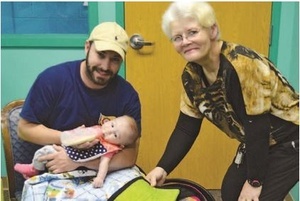 Thanks to our delivery volunteer, Jack Young, who brightened the day of young patients at Children's Hospital of the King's Daughters in Norfolk, VA. We are always talking about our wonderful, generous quilters, but we have to give a shout-out to our friends who load up their cars and save us considerable shipping costs. 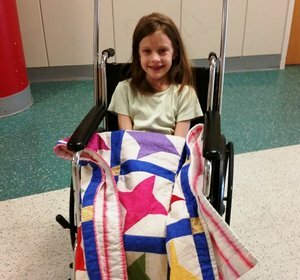 "We were able to deliver 26 pieced quilts to the Ronald McDonald House in Augusta on Monday. Thanks so much to everyone who helped get this donation together. In 2013 we donated 54 quilts, this year we more than doubled the number with 117 quilts donated. I look forward to continuing to work with you all to make 2015 even better. I wish you all a Merry Christmas and Happy New Year!" Berry Basket Quilt Guild of Medford, NJ. Founding president, Linda Arye, enjoyed your holiday party. Delivered by Sugarland, TX, Chapter! 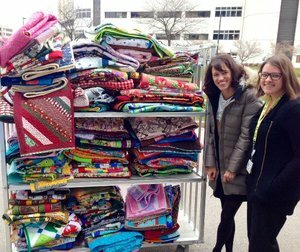 Delivered to Wisconsin Children's Hospital by Renee Henning and her Milwaukee Chapter! The River Hall group of the Lehigh Acres, FL, chapter held a successful fundraiser November 13th at the Residents' Welcome Back Social. Donations from community members included Baskets of Cheer, quilted items, golf items, and a variety of other treats. 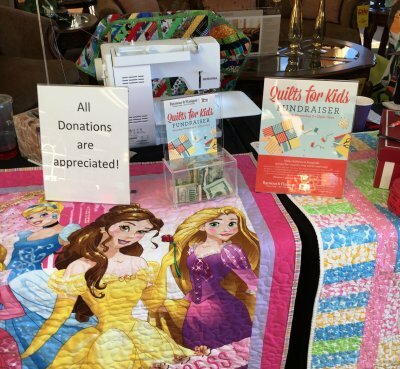 About 100 residents enjoyed a silent auction, raffle, and a "Buy It Now" table and raised a nice sum to help continue the Quilts for Kids effort to comfort children. "It took a great deal of work to stage this event," relates Shelly Albert, "but it was worth it. 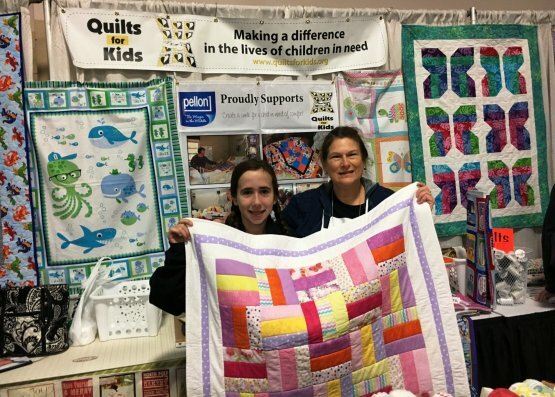 We are lucky to live in such a warm, generous place, where many people are committed to Quilts for Kids." 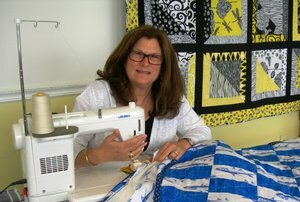 Brad Segall, recently spoke with Heather Walter, Visit Bucks County, Linda Arye, Quilts for Kids and Linda Weingard, Quilt Academy about quilting…a quilt exhibit at Visit Bucks County in Bensalem and Quilts for Kids on his radio program "Philadelphia Agenda," WOGL. ...for sending us this beautiful "Fruitful Hands" fabric by Jacquelynne Steves of The Noble Wife. We can't wait to see how the quilts turn out. 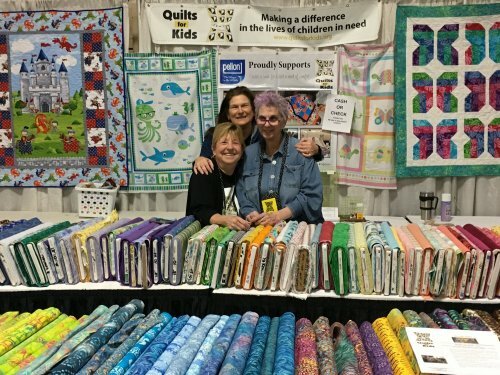 What began with two friends who share a love of quilting has become Just Because Quilting, a northern Minnesota chapter of QFK. 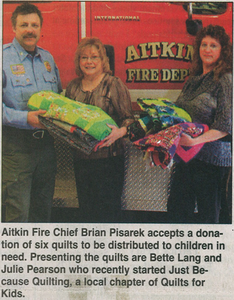 Aitkin residents, Julie Pearson and Bette Lang have just donated six quilts to the Aitkin Fire Department for distribution to children in need. 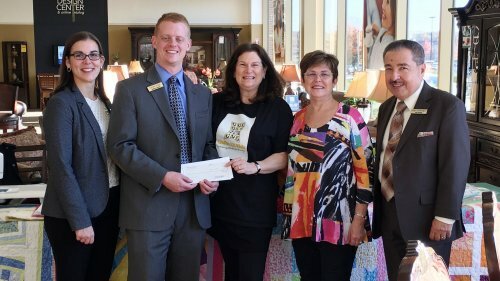 The Foundation of Jackson EMC, one of the nation's largest electric co-ops, has given a $5,000 grant to QFK's Northeast Georgia Chapter, reports Chapter Leader, Betty Wright. 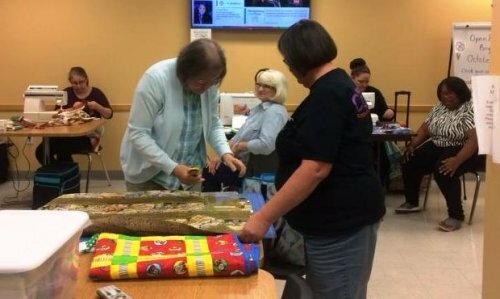 The not-even-two-year-old chapter has donated over 600 quilts made by 200 volunteers to children at Northeast Georgia Medical Center and local shelters. This grant will allow the group to continue to supply these children with the little quilts which are filled with love by the volunteers who make them. 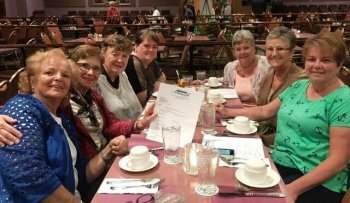 Pictured at left are workshop participants, Betty Wright (Chapter Leader), Betty Garrett, Jane Kesler, Sue Zarter, Donna Proctor, Marilyn Johnson and Judy Marsh. Not pictured: Pat Steinkraus, Anna Simpson and Chris Anderson. 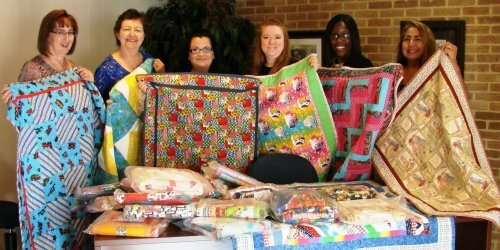 With the help of Ronald McDonald House, QFK Bakersfield Chapter (CA) delivered quilts to Memorial Hospital. Look carefully at the little boys in the picture. It seems they are way more interested in comparing their quilts than in listening to the grown-ups talk! 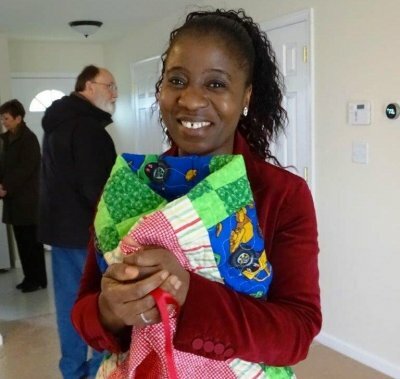 At a recent Habitat for Humanity Penn Villa Dedication, Habitat volunteer and avid quilter, Sara Bostancic, presented each child with a quilt, and spoke to the guests about her personal connection with QFK. Included Cheryl DeCamillo from our Sugarland, TX chapter on the left and Sharon Hicks from our Baton Rouge, LA, chapter on the right! This is just part of the shipment of donated kid-friendly fabric from Camelot. ...50 quilts to Lucile Packard Children's Hospital at Stanford in August. 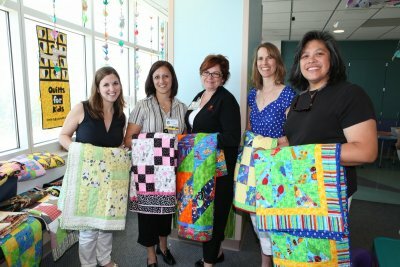 20 little quilts went to Children's and Women's Hospital in Mobile on Thursday. "What a joy to deliver so many blessings!" ...and 20 more to King's Home, Chelsea, AL. This is the Foster Care Center that Columbiana Chapter adopted as part of First Lady of Alabama, Dianne Bentley's state-wide project to give all foster care children in Alabama quilts of their own. ...with Pellon, Juki, and Camelot Fabrics. Over 1500 Quilts are on the Way to Oklahoma! Northeast Georgia Chapter Leader, Betty Wright, reminds us that their first year was a great success.